Pimentel to DPWH: Why bid projects without 2017 budget approval? MANILA, Philippines  Senate President Aquilino Pimentel III reprimanded the Department of Public Works and Highways (DPWH) for prematurely bidding infrastructure projects prior to Congress approval of the proposed 2017 national budget. Pimentel raised alarm over the issue during the plenary deliberations of the proposed P454.2-billion budget of the DPWH on Monday, November 21. Citing reports his office received, Pimentel said some district engineers and regional directors have supposedly started bidding out projects under the proposed General Appropriations Act of 2017 which has yet to be signed into law. "How can you possibly bid a project right now when there is still no law appropriating funds for that project? A bill is not a law," Pimentel said. "Aren't they treating the Congress' role in the budget-making process as mere formality? Na wala na palang magbabago diyan? (That nothing will be changed in the bill?) So we are just strengthening the rule of law concept; as well as of course, reminding them that Congress has a role in the budgeting process," he added. At present, the bill is being deliberated by both houses of Congress. Once the two chambers pass their respective versions of the budget bill, the Senate and House bicameral conference committee will hammer out a final version of the bill to be submitted to the President for approval. The General Appropriations Act only comes to force after the President  who may opt to veto some provisions in the final budget bill  signs it. Only then would the projects funded under the budget law be deemed officially approved. Citing the budget process, Pimentel questioned DPWH officials led by Secretary Mark Villar on how a proposed project could be implemented even if it has not yet been approved. "Ako poy nababahala dito kasi hindi pa po ito law. Ito po'y bill at pinaguusapan ngayon (I'm alarmed by this because this is still not a law. This is still a bill that is being deliberated on). So what is now the legal basis for bidding out projects anticipated to be part of a law but not yet officially part of a law?" he said. "Kung may tara sa Bureau of Customs, meron din palang obligasyon sa DPWH (If there is tariff in the Bureau of Customs, there is also an obligation in the DPWH), said Pimentel in a separate statement, referring to the "grease money" paid by "handpicked winning contractors to their connections" at the agency. The Senate leader pressed Villar to quickly investigate the reports and stop the scheduled biddings "to break the backbone of graft and corruption" in the agency which is prone to allegations of irregularities. He also urged Villar to fire erring DPWH officials and file charges against them. Villar is the son of Senator Cynthia Villar, who openly supported her partymate, Senator Alan Peter Cayetano, in seeking the Senate presidency against Pimentel. Senator Loren Legarda, sponsor of the DPWH budget as the Senate finance committee chairperson, defended the agency, saying this was the practice even in the previous administration to "speed up" processes. Senator Juan Miguel Zubiri, a known Duterte ally, cited "practical concerns" in the practice of implementing proposed projects despite the absence of the implementing law. Zubiri said that if the projects are bid out in the first quarter of the year, or after the signing of the budget law, the projects could only be implemented by the second quarter or the onset of the rainy season. What can I say, then PASS the BUDGET before October para naman maka-bid out ng November and start the project in January 1. Hirap ba? ang hirap kasi sa mga legislators na mga ito. Ang kukupad sa deliberation. Ayusin nila ang schedule ng budget gathering. Move nila ng 2 months earlier. Tapos pass the budget by October. Ang swapang. Inappoint ang sarili. Yan ang crocodile sa PDuts admin. Wala na bang ibang tao sa mundo. this is called EMERGENCY POWERS ........... or DAANG HARI. Transportation Secretary Arthur Tugade could face legal troubles for his move to transfer more than P40 billion in unspent funds of his department to another agency under it to make it appear the department was efficiently using its budget, senators warned yesterday. During plenary deliberations on the proposed P53.9-billion budget of the Department of Transportation (DOTr) for 2017 last week, it was disclosed that the agency has unspent funds amounting to P19.2 billion from its 2015 budget and a whopping P23.6 billion for 2016, equivalent to almost half of the funding it is asking for next year. ^oh hindi ba DAP ang tawag dyan? If it will be use on the original allocations, its not DAP... if the funds on 2015 and 2016 were not implemented due to some reason, they can still spend those in 2017 as long as the project is still the same. "Legarda said the downloaded funds were considered obligated so the DOTr would not revert it back to the National Treasury." tama naman. the h3ll are they bidding out this early for kung wala pa namang budget available. that is the basics of the general appropriations act. kaya nga illegal yung license plates ni MariMar dahil binid out yan without any approved budget. ngayon uulitin nanaman ng pamahalaang dut|t|? If President Rodrigo Duterte is intent on going after corrupt officials next, he may want to start with who is behind the lump sums in the P3.35-trillion national budget for 2017, Sen. Panfilo Lacson said Monday. Lacson made the suggestion after finding such items during the Senates deliberations last week on the proposed 2017 national budget. During the Senate deliberations on the proposed 2017 budget, Lacson noted millions of pesos in lump sum appropriations, including P500 million for the DPWH central office. On the other hand, he also questioned why the House of Representatives moved some P8 billion from the budget of the Autonomous Region in Muslim Mindanao to that of the DPWH. Recto said it was irregular and the monies could not be considered automatically obligated. Recto hit what he said was an emerging bad habit among agencies to transfer their allocations to other agencies and then report such transactions as fund utilization. In the case of the DOTr, he said, this is the scheme resorted to in its unused budget for airport improvement, through an 11th hour delegation of funds to CAAP in a bid to beat the two-year expiry date of the appropriations. The rule ought to be this: agencies must spend the buck and not pass the buck. Transferring funds to another government agency is not fund utilization. It is not procurement but an accounting trick to prettify the books in order to give out a glowing report card, Recto said. Apparently, the budget will not be used for the SAME project. Fight against corruption my ***, wala ng lunas ang corruption sa Pinas dahil ingrained na ito. The image Rodrigo Duterte projected of his 2016 presidential campaign was that it was one run on a shoestring budget. It supposedly had no donors with vested interests, and that included big businessmen and mining firms. But the Statement of Contributions and Expenditures (SOCE) he filed with the Commission on Elections (Comelec) after he won the presidency paints a different picture. According to his SOCE, the P375 million Duterte raised for his campaign came mainly from big businessmen. No doubt, this is far from how Duterte and his followers had described his campaign team: That the masses who could afford to donate only "Emilio Aguinaldo" money or five-peso coins would be the ones sending him to Malaca?ang. Just six months after the elections, Duterte has appointed at least half a dozen of his donors and their relatives to Cabinet and other positions, even as one campaign contributor has already snared government contracts and flaunted on social media his claimed closeness to the President. This donor, a Chinese-Filipino business partner of Duterte who runs a cockpit in Davao City, has even posted on his Facebook page his photos with the President and the Japanese premier that were taken from Duterte's recent state visit, as well as with Duterte, and his children and sibling. 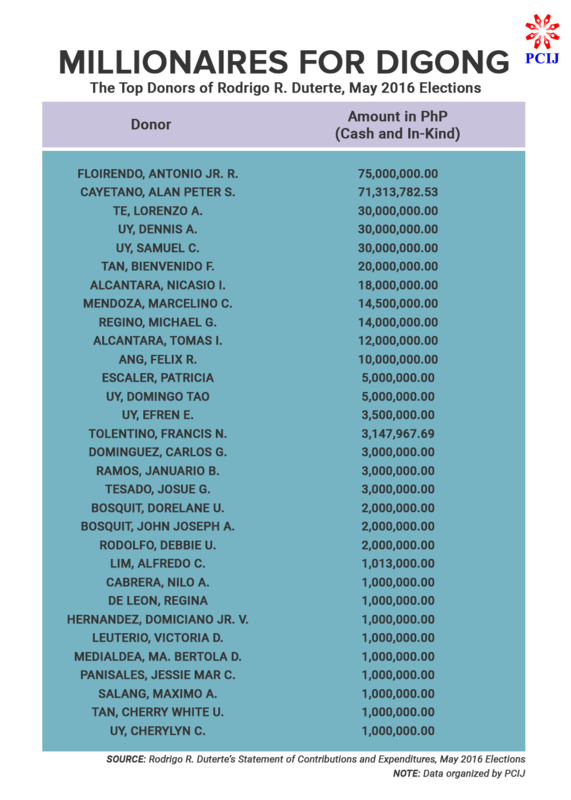 And yet by the rules of the Commission on Elections (Comelec), this campaign contributor and several others should not have donated at all to Duterte?s campaign. Section 95 of the Omnibus Election Code prohibits ?natural and juridical persons? who have business interests in utilities, mining, and the like from making election contributions. Mukhang nakasuhol si lam. Kaharap na ni aguirre, di pa hinuli. Ganun din kaya with alleged drug lord peter lim? Leila De Lima claims it was Bong Go that ordered Supt. Marvin Marcos to be reinstated as CIDG 8. Bong Go has categorically denied this. And DeLima is telling the truth AFTER ALL. And the dutertards are spinning other stories that it was a trap. pressured na si Bato, kailangan na nya Pumasok sa loob ng BAHAY ni KUYA.